THERE are just a few moments in Frank Marcus’s poignant and prescient play The Killing of Sister George that underline how much things have changed since it was written in 1964. Its Wikipedia entry says that Marcus intended it as a farce, but it was taken up as an iconic drama-with-laughs by a Lesbian community starved of theatre to which they could relate. But after Beryl Reid’s film performance its farcical intentions were scuppered. Broadcasting House and the BBC are tat the heart of this story, and it’s salutary to see that more than 50 years ago the move for audience ratings and box ticking was bubbling under an increasingly corporate surface. Actress June Buckridge, whose sexual tastes must be hidden from colleagues and (of course) Auntie’s audience, has spent the past six years creating the role of Sister George in an Ambridge-style radio soap. 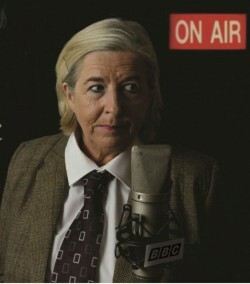 She has been the series’ most popular character, a down to earth and robust district nurse on a moped. But “George” (as Buckridge thinks of herself) has been a “bad boy”. Her latest drunken foray – in a taxi full of novitiate nuns – can’t go unpunished. And the audience figures are dropping. Director Tracy Jane Murrey cleverly integrates the radio recordings and broadcast into this single-set play. Amy Loughton is a stronger and more charismatically manipulative Childie than in some performances, and Judy Norman makes the most of every nuance of the Russian fortune teller downstairs. Celia Muir is all feline elegance as Mrs Mercy, delivering her coup-de-grace with a frosty smile. The central role is, of course, Sister George, played with gusto by company regular Julia Savill. Although the play has been criticised as portraying caricature lesbians in a negative way, most of the progressive 60s and the experimental 70s hadn’t yet happened, and roles were clearly delineated. I’m sorry to say that June Buckridge would NEVER have worn that dressing gown. A man’s camel or plaid would surely have been easy to find. And the hair (which I suppose is needed for the revival of the wonderful The Woman Who Killed Her Husband in less than a month) would have been more convincing short. Julia Savill’s timing is famous, and came to the fore in the wonderful Stan and Ollie scene, the touching speech about the bath mat, and the despairing closing moments. The Killing of Sister George is a period piece, not only a look at a time when the line “I’m not married to you, George” addressed a legal impossibility but also an inconceivable thought” but the early rumblings of big business and its effects on artistic communities. It is well worth producing, and Dramatic Productions are doing it proud and it is on stage in the Studio Theatre at the Lighthouse until Saturday 7th May. Posted in Reviews on 6 May, 2016 .